We aim to be stewards of exquisitely designed textiles, otherwise discarded or difficult to find. We reclaim and collect new fabrics from the finest luxury furniture companies throughout the United States and offer them to you at 50-75% off list price. We focus our selections around designer commercial-grade textile companies including Maharam, Knoll Textiles, Designtex, Pollack, Carnegie, Momentum, Sina Pearson, Brentano, Luna Textiles, Unica Vaev, HBF Textiles, Architex, Jhane Barnes, Arc|Com, Kravet, and many more. 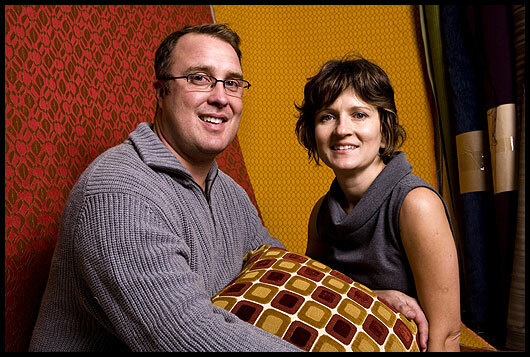 Additionally, we have also become a prominent online source for discounted residential decorator fabrics. This exquisite offering includes textiles from Schumacher, Romo, Holly Hunt, Dedar, Lee Jofa, Donghia, Cowtan & Tout, China Seas, Kravet, Serena & Lily, Ralph Lauren, Zimmer Rhode, Ethan Allen, Robert Allen, Designers Guild, and more. These textiles are generally only offered to-the-trade (designers and professionals), yet we make them available to everyone. Modern Fabrics is your online resource for high quality textiles and fabric design. We have a comprehensive collection of reclaimed interior textiles, featuring innovative materials, iconic modernist designs, and timeless textures. Whether you make pillows, handbags, furniture, quilts, or clothing, we surely have something you are looking for. If we don’t have something for you today, check back often as we continuously update our selections. We have seen firsthand, at numerous furniture factories and cutting and sewing workrooms, the grim reality of waste and disposal of textile fabrics. An overwhelming majority of textile waste winds up in black plastic yard bags in a landfill. Countless discarded and unused bolts of fabric fill our landfills everyday. Customers Own Material (COM) fabric is the worst culprit. Upon filling an order, there is no incentive to store or reuse fabrics which have been paid for by a customer. It is not cost effective for manufacturers to return or ship the fabric to the customer. Furthermore, most customers simply have no interest in having excess COM returned. As you can see in our online store, quantities of excess COM can range from one yard to 100 yards or more! Modern Fabrics is committed to building a larger market for these discarded fabrics while ensuring an ecological textile life-cycle. We want to encourage designers and do-it-yourselfers to utilize existing sources of textiles before resorting to consuming more raw materials. There is quite simply a glut of fabric out there that begs the attention of our creative professionals. Much of this fabric is of the highest grade, with contemporary designs from sought after and respected manufacturers. The internet is the perfect medium to bring this source to a wider market and simplify the recovery process. While we are a small mom-and-pop company, as we grow, we aim to lessen our impact on Mother Earth. Collecting fabric from factories, upholstery shops, and cut-n-sew operations requires a lot of weekly driving around. 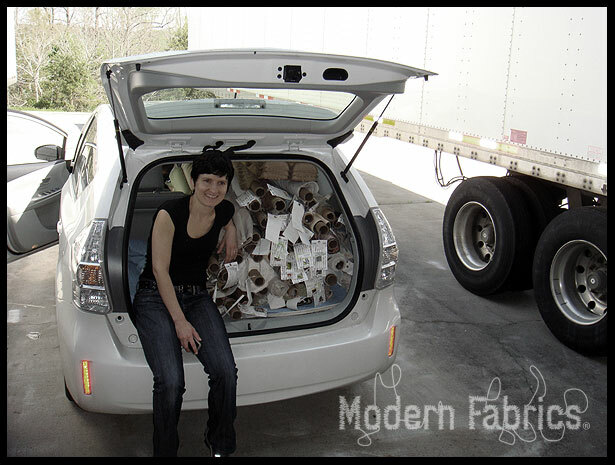 In 2012 Modern Fabrics purchased our first hybrid vehicle for picking up numerous weekly “batches” of fabric. Of course, we also now commute to and from our Charlotte retail store in our new Prius as well! We are pleased to note we have effectively cut our fuel consumption in half by making a simple choice. We urge all of our customers to consider switching to low fuel/emission vehicles if you have the means. Finally, we have implemented a partnership program in which furniture/textile manufacturers partner with Modern Fabrics to ensure the proper reuse and recycling of what is otherwise industrial waste. Not to minimize their responsibility, these manufacturers are simply not in the recycling business. Through partnerships with recyclers and consultants, furniture manufacturers can make strides toward a more ecologically responsible future. After all, their customers expect, and deserve, nothing less! Reduces the need for landfill space. Textiles present particular problems in landfill as synthetic (man-made fibers) products will not decompose, while woolen garments do decompose and produce methane, which contributes to global warming. Aids the balance of payments as we import fewer materials for our needs. Results in less pollution and energy savings, as fibers do not have to be transported from abroad. Purchase good quality furniture made with sustainable materials and finishes. Make a more ecologically sound choice of wood from a supplier who can verify through a chain of custody that the original trees came from an ecologically sustainable forest managed under guidelines of the Forest Stewardship Council. Reuse your furniture. Reupholster with reclaimed fabrics or fabrics made from post-industrial and post-consumer recycled fibers. Do not throw away your old fabric or draperies! Repurpose all fabrics for other use, or donate them to the growing number of recycling facilities. Call you local municipality for programs in your region. 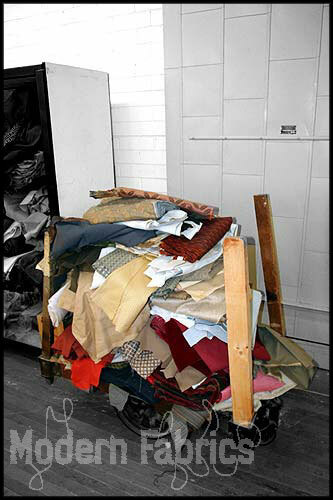 At Modern Fabrics, we are committed to diverting designer interior fabrics from the solid industrial-waste stream. All of our fabrics are recovered, post-industrial waste generated during the domestic manufacture of new upholstered luxury residential and commercial furniture. These fabrics are in new condition, immediately ready to be upcycled and reused on your furniture, cushions, craft or interior design projects. By specifying Modern Fabrics on all of your interior projects, you are contributing to increasing the demand for building products that incorporate recycled content materials, therefore reducing impacts resulting from extraction and processing of virgin materials. All of our fabrics contribute to qualifying for LEED® credits.